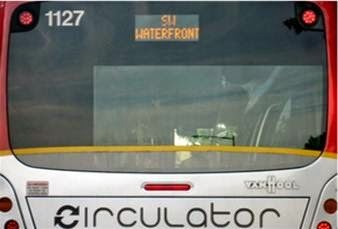 DC Circulator service to Southwest will be restored and enhanced if proposed changes by DDOT are approved (the DC Council already approved funding for a 1.4-mile westward extension of the Union Station – Navy Yard route along M Street to the Waterfront Metro to begin operations in FY 2015). Last week, DDOT released the DC Circulator Transit Development Plan for the next 10 years that shows a total of three Circulator lines that could service Southwest by 2024. Aside from the aforementioned extension, the Convention Center – Southwest Waterfront route would be restored in Phase II by FY 2020 (it was discontinued in 2011 and replaced by the 74 Bus) and a new route would connect Dupont Circle to Southwest via 17th Street, NW and Maine Avenue during Phase III by FY 2024. These new (and restored) lines would coincide with the opening of The Wharf and other planned development in Southwest. It is estimated that ridership will increase by nearly 14% with the Southwest extension of the Union Station – Navy Yard route; however, ridership along this route is currently the lowest of the five existing Circulator routes. This route extension (along with two others) did not meet several key Circulator performance metrics, but it will still move forward since it was already funded by the DC Council. DDOT will be evaluating whether the Near SE/Navy Yard/Capitol Riverfront area can support year-round Saturday service and year-round service after 7pm on the Union Station – Navy Yard route, which would benefit Southwest once this line is extended to the west. Currently, service hours vary depending on the time of year; there is no plan to offer Sunday service on this route. Of the three lines proposed for Southwest, ridership projections for the new Dupont Circle – Southwest Waterfront route are highest. Over 1.2 million annual riders are expected on the new route, compared to 762,000 riders for the restored Convention Center – Southwest Waterfront route. During the public engagement process earlier in the year, there were six pop-up events across the city where surveys were collected, in addition to online surveys. Of the six pop-up events, the most responses were collected at the Waterfront Metro station pop-up, garnering 15% of all survey responses. More than half of the respondents to the survey indicated that the Southwest Waterfront should be served next by the Circulator – the most of any location, followed by U Street Corridor/Shaw/Howard University. Other new routes are planned as well in other parts of the city – one would connect Columbia Heights to Brookland and NoMa, while another would go from the National Mall to Union Station, as well as extensions of existing lines. Circulator fares would increase to $1.50 on SmarTrip and $2.00 cash from the current fare of $1.00. The DC Circulator Transit Development Plan is open for public comment until November 7. A Semi-Annual Open House on October 20 from 6-8pm will provide residents the opportunity to weigh in on the plan. It will be located at Pinstripes in Georgetown (1064 Wisconsin Avenue, NW). In addition, comments may be submitted by clicking on the contact us link located on the DC Circulator website. For more information on the TDP, contact Circe Torruellas or call 202-671-2847. There will be an Open House/Community Information forum tomorrow evening hosted by representatives from the District government, DC United, and developer Akridge to discuss the pending agreement to build a new soccer stadium for the team at a site in Buzzard Point. The Open House follows a forum hosted by SWNA earlier this month. At the SWNA-hosted forum, consultants stated that the existing housing north of the stadium site will be preserved and development in Buzzard Point will be oriented toward Potomac Avenue to connect the area with the rest of the Capitol Riverfront neighborhood east of South Capitol Street. According to the media advisory for tomorrow’s Open House, this is an opportunity for community members to receive the very latest planning updates and answers to any questions they may have about the project, all in an informal setting. Representatives, government officials and key consultants will be available to discuss planned traffic operations, housing, environmental clean-up, jobs, contracting and more. Capital Business and the DC Fiscal Policy Institute have articles describing a Community Benefits Agreement that the CBCC is negotiating with the city and DC United - the major component being a $5 million community fund to support recreational and educational programming for the community’s youth. Tomorrow’s Open House will be held at 100 M Street, SE, 8th Floor from 6-8pm. 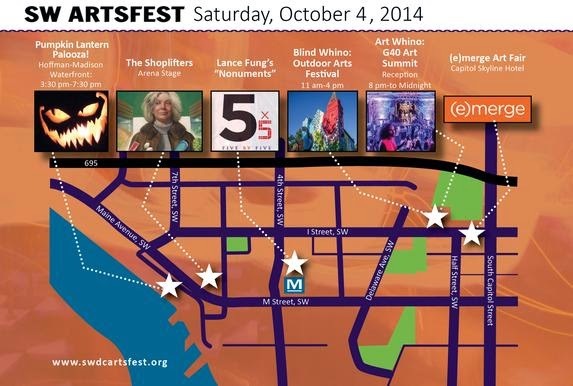 The fourth annual SW ArtsFest will take place from October 2-5 at venues across Southwest. Events include (e)merge Art Fair, art installations at Nonuments Park, The Shoplifters at Arena Stage, the G40 art show at Blind Whino, and Pumpkin Lantern Palooza at The Wharf. Check the SW ArtsFest website for more information on which venues will be available and when. There will be a mayoral forum on Monday, October 6 at 7pm at Arena Stage, sponsored by ANC6D, SWNA, and the Navy Yard Civic Association. The forum will cover topics of importance to those who live south of the freeway and west of the Anacostia River. The moderator will be Shannon Vaughn, editor-in-chief of The Southwester. Vaughn hosted the Mayoral Forum that was held ahead of the April 1 primary. DC’s local chapter of DOCOMOMO, an international preservationist organization, is hosting a guided tour of modernist architecture in Southwest on Saturday, October 11. The press release states the following: The event will begin at 1:30 pm at Arena Stage with an introductory talk by Dr. Richard Longstreth of George Washington University, followed by two walking tours and a reception in the roof-top Club Room at the Chloethiel Woodard Smith-designed Harbour Square, which overlooks the Potomac River. The tour will also include access to unique interior spaces of the neighborhood's most noted projects, including Arena Stage, Waterfront Tower and River Park. Tickets are $15 for students, $25 for members of the DC Preservation League and DOCOMOMO-US/DC, and $35 for non-members. The next DC Job Fair, hosted by Arena Stage and Ward 6 Council member Tommy Wells' office will be held on Friday, October 17 at Arena Stage from 10am - 2pm. This year's event will feature a new partnership with the Office of Returning Citizens Affairs, which provides support and services to previously incarcerated individuals - the fair will be targeted toward these individuals. According to the press release for the event, recruiting companies committed so far include Big Bus Tours, Bread for the City, Building Futures, DC Central Kitchen, Fort Myer Construction Corporation, Giant Food, Harris Teeter, Specialty Hospital & Nursing Center of Washington, and the U.S. Postal Service. ANC 6D will have their next monthly meeting on Monday, October 20 at 7pm. The meeting will be held in Near SE/Navy Yard/Capitol Riverfront at 200 I Street, SE. A day after seeing the show, I saw Houdyshell at the Waterfront Station Safeway and was tempted to tell her not to use the five-finger discount, but I resisted the urge to do so. If you’re looking for a good laugh and have 90 minutes to spare, I’d recommend seeing The Shoplifters. 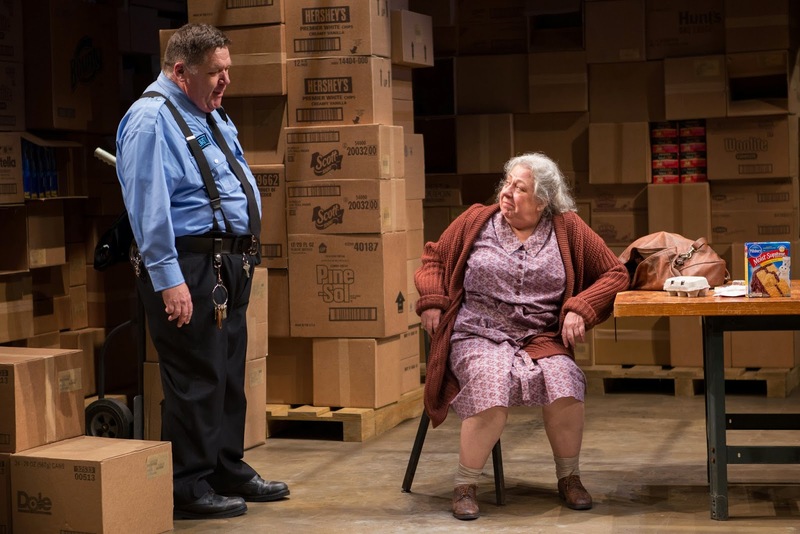 Tickets for The Shoplifters are from $45 to $90 and the show will run at the Kreeger Theater until October 19. Unfortunately, Southwest Night already passed for this production since it was on September 9. A new dog park at Lansburgh Park, located along Delaware Avenue is now open for use. After several years of fundraising by the PAWS of Southwest, the 10,000 square-foot off-leash Lansburgh Dog Park was recently completed by the Department of General Services and will operate as a Department of Parks and Recreation facility. There are two fenced off areas - a 2,000 square-foot area for small dogs and 8,000 square feet for large dogs; each section has water stations. There are also seating areas for dog owners to relax and watch their canine companions play. The Lansburgh Dog Park is open from 7am to 9pm Monday - Friday and 8am to 9pm Saturday - Sunday and holidays. All dogs using a dog park must be licensed and registered in the District of Columbia. All dogs are required by law to be vaccinated and registered. All dogs must display a Dog Park Registration Tag, and other tags as required by law. There is a limit of 22 dogs in the dog park at any time. Lansburgh Park has received several improvements in the past two years. Last year, the run down tennis courts were replaced with basketball courts and the SW Gardens group received a grant from Fiskars to transform a portion of the park into a community garden. The PAWS of Southwest and the SW Gardens group are both fiduciary subsidiaries of SWNA, which announced that a second grant was recently awarded to the group in order to expand the garden with more raised beds. The empty, District-owned lot north of CVS at Waterfront Station has been transformed into 'Nonuments Park', which made its debut in Southwest earlier this month. 'Nonuments Park' was designed by artist Lance M. Fung and is one of the components of The 5x5 Project, a city-wide endeavor displaying temporary art installations. The following photos show the different components of 'Nonuments Park.' The placement of 33 trees in a "sinuous line" by Peter Hutchinson (see above photo) separate the different artist installations on the site while the mounds of dirt concept by Eliza Naranjo Morse and Nora Naranjo Morse will change daily over the course of a month - people will dress up in costumes representing different aspects of American culture while digging, which "empowers each of us to face personal and social challenges." Another section of the park features a sculpture garden in the likeness of Southwest resident Alpha Lillstrom, designed by Jennifer Wen Ma. According to The 5 x 5 Project webpage on Nonuments Park, "community member Alpha Lillstrom was chosen by lottery for the portrait, paying homage to a citizen whose deeds are not necessarily grand in the scheme of human history, but whose challenges are still heroic in the arduous struggles of daily life." The pink shipping container with the word "Peep" spray painted on it was designed by Jonathan Fung and has holes cut into it. A look inside reveals photos of children - victims of human trafficing from around the world as well a sewing machines, since many of these children are forced to work in sweatshops. The tall white structures are called "Migration", which is meant to represent "a home threatened, yet resilient in the face of displacement and climate change." The nests designed by Cameron Hockenson also represent neighborhoods in Washington DC that are changing due to gentrification. Scattered throughout the park are monumental seating areas that are the product of the "Mud Dance" that occurred last month, which were designed by Michael Koliner. Four new restaurants have signed leases in the revamped retail center at L'Enfant Plaza according to an article in the Washington Business Journal. The latest lease signings include two concepts new to the Washington region - Pie Five, a Dallas-based fast casual pizzeria and Green Beans Coffee, which started out operating near military bases in foreign countries. The other restaurants are Jamba Juice and California Tortilla. 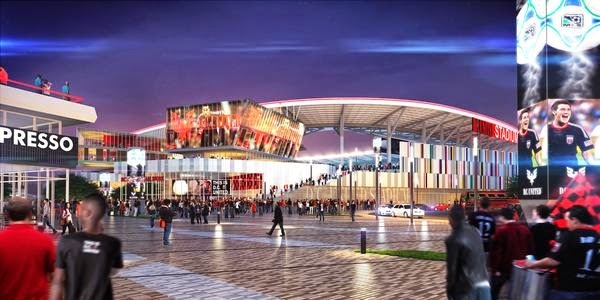 This was mentioned on my Twitter feed, but there will be a forum hosted by SWNA this evening at Arena Stage, starting at 7pm to discuss the proposed soccer stadium in Buzzard Point for DC United. Members of the DC Council and the ANC will be present, as well as representatives from DC United, the Gray Administration, and the CBCC, which is working on a Community Benefits Agreement for the stadium. Demolition is about 75% complete along the 700 to 900 block of Water Street, including Zanzibar, the Kastles Stadium site, and Phillips Flagship. Work on the marina side is eight weeks ahead of schedule with piles completed for the new Capital Yacht Club and work underway for the Transit Pier and District Pier. About 8-10 piles are driven into the Washington Channel per week, with about 130 piles needed to complete pier construction. Meanwhile, demolition will begin later this month at St. Augustine’s Church and a large storm drain will be relocated before construction begins in late October to early November on a 108-unit condo building. Construction of the new church will begin in early 2015 and Waterfront Park will begin construction in the spring of 2015. The church and park will be completed around the same time – the first quarter of 2016. The large Copper Beech tree on the church’s property will be relocated to the site of the Maine Lobsterman statue in the future Waterfront Park to the south. The statue will be put in storage until phase one of The Wharf is complete and will be reinstalled near the Maine Avenue Fish Market. The former Channel Inn will soon be the temporary home for the Capital Yacht Club, The Wharf’s marketing center, space for master planner Perkins Eastman, the construction office for Clark, and the corporate offices for PN Hoffman and Madison Marquette. In addition, the cafeteria space will be converted to a café operated by the proprietors of Jenny’s Asian Fusion restaurant. Jenny’s Asian Fusion will close on September 28 from its current location on the waterfront and will relocate to a smaller café space at the Channel Inn sometime in December. Over by the fish market, a new parking lot will open by mid-October, which should alleviate some of the parking issues on the east side closer to the Channel Inn. Also, pedestrian and bike access will soon be diverted from the south side of Maine Avenue to the north side between 7th and 9th streets. The construction team will soon begin posting weekly updates of their traffic control plan. If you’re a kid in Southwest, play options in the neighborhood have improved recently and will soon get even better. After more than a year of delays, the Randall Recreation Center playground at South Capitol and I streets will become the latest District playground to be revamped under DPR’s Play DC initiative when construction begins later this month. In addition to the Randall playground, the King-Greenleaf Recreation Center playground will also be renovated this fall. Last month, the 3rd & I Street Park adjacent to the Southwest branch library was renovated and a playground was added. In the last two years, a playground was added at Syphax Gardens and the play equipment at Amidon-Bowen Elementary was replaced. The renovations at Randall will cost over $1 million to complete and will begin on September 15 with completion before the end of the year. 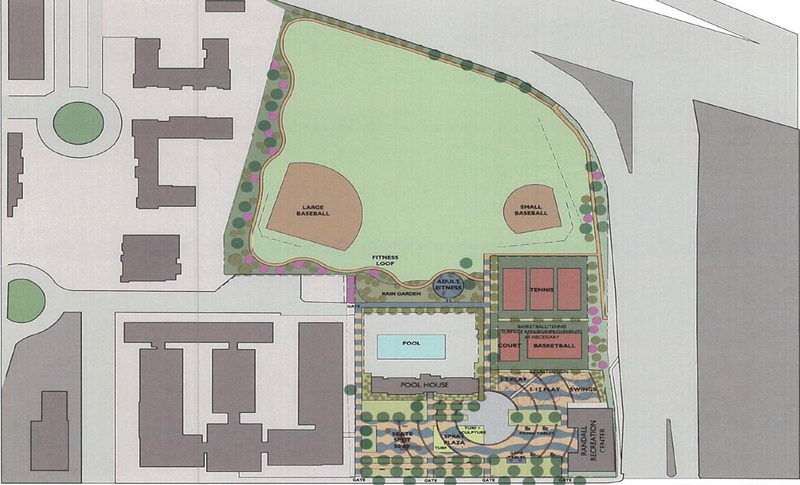 Improvements include: new playground equipment for all ages, renovation of the existing basketball/tennis courts, removal of asphalt and brick walls and installation of a new splash park and seating areas in the plaza area fronting I Street, a skate park, walking path, adult exercise equipment, drinking fountains, picnic & game tables, security lighting, fencing, landscaping and gates. The park funding had been in limbo since 2013 when KIPP unsuccessfully lobbied to build a charter school on the site. Subsequently, the Office of Planning conducted the Southwest Neighborhood Plan, whose final recommendations should be released this fall.